Some people are a little confused about what color chartreuse actually is. The answer is simple–it’s 50% yellow and 50% green. Depending on where and how it’s used it can take on the look of one more than the other. So although chartreuse is a fantastic color for home décor, there are a few things to keep in mind when decorating with it. Do use chartreuse as an accent if you want a bright pop of color. Consider a feature wall, a door, a piece of furniture, or some other type of bold accent. Don’t be afraid to use chartreuse all over. While it makes a great accent color, it can also work beautifully as a wall color. Do combine chartreuse with dark, saturated colors like midnight blue. The contrast creates a bold and energizing effect. Don’t think that chartreuse is limited to modern or eclectic design. Pale versions of chartreuse look right at home in traditional rooms. Do use brighter shades of chartreuse if you want to make an impact. Opt for softer hues if you want it to blend in with other colors. Don’t ignore the importance of lighting. The amount of light in a room has a huge effect on how chartreuse will look (more green or more yellow, depending). When choosing a chartreuse paint color make sure to test it out first. Chartreuse is a big bold color with a lot of personality. It’s extremely versatile and pairs with almost any other color. However, depending on what effect you want to achieve, you’ll want to think carefully about what colors to pair it with. Grey and chartreuse pair perfectly together―particularly deep grays that are more warm than cool. Try putting a chartreuse sofa or chair against deep gray walls for a soothing yet modern look. When paired with dark blue, chartreuse takes on an electric vibe. This combo is particularly trendy so if you like to be on-trend, try combining chartreuse furniture with deep blue, saturated walls. Combining chartreuse with reds and oranges is a great way to create a fun and friendly environment. When mixed together the two are inherently playful. Try tossing some deep orange accent pillows on a chartreuse sofa for an easy mix. Soft chartreuse and soft lavender create a pretty and soothing palette that works particularly well in the spring. Accent pillows and accessories are the perfect way to bring in both colors. White has the ability to tone down any other color and give it a light, spring-like feel and chartreuse is no different. 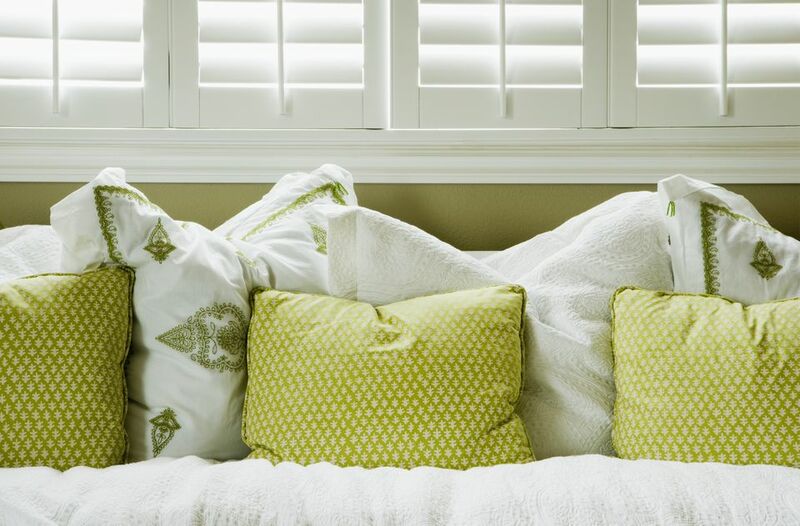 Combine chartreuse and white for a fresh and airy look. Chartreuse is a fairly trendy color at the moment and it’s hard to say if it will stay that way or not. If you’re unsure about whether or not to commit, try it in small doses. Vases, pillows, paint–they’re all great ways to infuse a hit of this fun color (and easy to change if you fall out of love with it later). Whether or not it remains popular, chartreuse is perfect for cheering up any dreary space.